The Kansas City Symphony has received a $2.7 million donation from the remainder of the David T. Beals III Trust, Bank of America, N.A., Trustee, to endow the assistant conductor position. “We are humbled that the David Beals Trust is supporting the Kansas City Symphony in such a profound way,” said Symphony Executive Director Frank Byrne. The Kansas City Symphony has received a $2.7 million donation from the remainder of the David T. Beals III Trust, Bank of America, N.A., Trustee, to endow the assistant conductor position, henceforth named the David T. Beals III Chair. This generous gift helps the Symphony sustain its remarkable success, secure its financial future and ensure its ability to serve the Kansas City community with world-class symphonic music. Each year, the Kansas City Symphony touches the lives of more than 1 million people through its many concerts, programs, events and media broadcasts. The David T. Beals III Assistant Conductor is an important and influential role at the Symphony, leading all pops, family, holiday, special and Classics Uncorked concerts each season. Additionally, the assistant conductor helps design the Symphony’s education programs and conducts the orchestra for many prominent community events such as Pops in the Park on Labor Day and Symphony in the Flint Hills “Signature Event” in June. After a series of rigorous auditions, the Kansas City Symphony appointed Jason Seber to the David T. Beals III Assistant Conductor position in December 2015. Seber officially will begin his post this fall. Seber succeeds Aram Demirjian, who was with the Symphony for four seasons. A lifelong resident of Kansas City, David T. Beals III was a strong patron of the arts. In 1982, the David Beals Charitable Trust, for which Bank of America, N.A. serves as the trustee, was established to further the development of charitable purposes in the public’s interest. Mr. Beals wishes were to distribute the remainder of his trust 10 years after the passing of his wife, Jeanne McCray Beals. Symphony Board Chair William Lyons expressed his deepest appreciation as well. 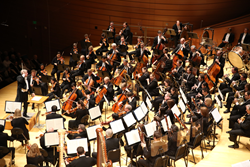 Founded in 1982, the Kansas City Symphony has established itself as a major force in the cultural life of the community. Praised for performances of uncompromising standard, the orchestra is the largest in the region and enjoys a national reputation under the artistic leadership of Music Director Michael Stern. The Kansas City Symphony Chorus is a volunteer, 160-member ensemble led by multi-Grammy® Award-winning conductor, Charles Bruffy, that continues its long tradition of excellence as the choral voice of the Kansas City Symphony. The Kansas City Symphony performs more than 100 concerts each year, while also serving as the orchestra for the Kansas City Ballet and Lyric Opera of Kansas City, and it often welcomes guests of international acclaim as part of its Classical and Pops Series. Complementing its full schedule of concerts, the Symphony enriches the lives of Kansas City residents by providing music education opportunities for children and adults, such as KinderKonzerts, Young People’s Concerts, an instrument petting zoo and concert comments. Highlights each season include a range of free master classes, events and concerts reaching more than 200,000 community members, including the annual Bank of America Celebration at the Station concert each Memorial Day weekend and Symphony in the Flint Hills every summer. The Symphony has released five CDs to date with Reference Recordings. Two additional projects have been recorded and slated for future release, including the music of contemporary composer Adam Schoenberg (recorded June 2014) and Holst’s The Planets (recorded January 2015). The Symphony and Stern will record three one-movement symphonies (Barber’s Symphony No. 1, Sibelius’ Symphony No. 7 and Scriabin’s Poem of Ecstasy) in late June on the Reference Recordings label.